Hi everybody! Well, the band Silence Oath was created in 2007 as an extreme metal one-man-band. I am the only member in this project. In the beginning, my intentions were not very ambitious; this project is born almost as a joke, for spending my time recording a more extreme music than usual for me: in fact I played and sang in a power metal band for seven years or so, and so I decided to start this one-man-band. 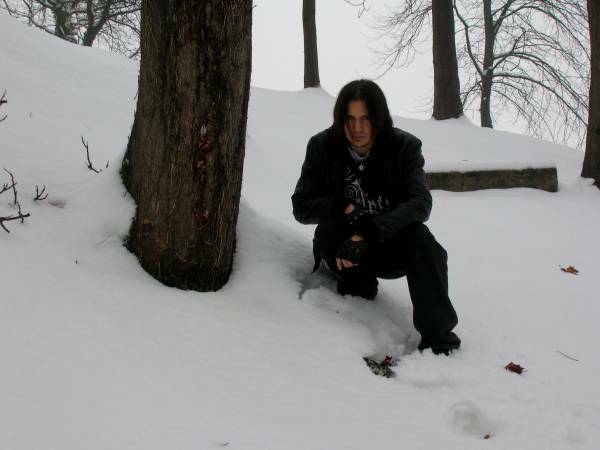 I recorded the first demo-album called "Cursed” with my computer and a indecent microphone, but then I wanted to bring Silence Oath to a higher quality level, so I began to write my second album, entitled "Beneath A Bleeding Sky”, that was finally ready in April 2010. So now this album, recorded in a better quality than the first demo, has reached for the interest of the Italian label Invincible Records, and so it’s ready to be published for the digital market in the first month of 2013. In this project I write all music and lyrics, playing all the vocals, all the instruments and programming drum-machine and some orchestrations. My friend Nick, great and technical guitarist, helped me to record this second album and played all the guitar solos of "Beneath A Bleeding Sky” album, as guest musician. When I created the project, the sound was oriented to an old-school death metal with a few black metal riffs and a few keyboard’s scores. Nowadays, the Silence Oath sound is oriented to a symphonic black metal, with some death and thrash metal riffs, some orchestral sections and a lot of melody. The main bands that influenced my music are worldwide acts as Cradle Of Filth and Dimmu Borgir, but also minor bands as Dragonlord, or Riul Doamnei (friends of mine coming from Italy). Anyway, there are also many bands from which I take my inspiration for writing Silence Oath’s music: Wintersun, Rhapsody Of Fire, Darkthrone, Immortal, Windir, Bathory, Equilibrium, Ensiferum, Arcturus, Opeth, Dissection, Emperor, Death, Ulver…and many more. My influences are very vast and the next Silence Oath album will be more experimental and progressive than the past. In my albums there is no expensive production, there’s no bombastic sound; there is only metal music made with passion and efforts, and I think this is the main feature that a metal album should have. If there’s no passion in the notes of a record, there’s no reason to buy it and to support a band or a musician. Anyway, in concrete terms, in my works every metalhead can find aggressive guitar riffs, based on a violent computer-drumming, melodies and keyboards to create the right symphonic atmosphere, growl vocals, scream vocals, clean vocals, guitar solos…Definitely, in my albums, a metalhead can find all he’s looking for in symphonic black metal style and all he needs to enjoy and do headbanging. Well, in early 2007 I released my first demo entitled "Cursed”, but honestly it’s a record I would forget, because it was born for joking and with goliardic intents. So, the only album I released that has been submitted to public’s critic is "Beneath A Bleeding Sky”: in fact, during the two last years, I put up the album on internet, available for everyone in download or streaming. My friends that listened to this record generally appreciated it, but from some webzines honestly I received many contrasting judgments about it: generally, the ratings were around six or seven points on ten. For me these are great ratings ahah! Seriously, for me the most important things in a review are not the rating points; the constructive critics are the most important things, ‘cause with these I can improve myself, my style and my song-writing. I don’t play live, because Silence Oath is a one-man-band, and sincerely I don’t see reasons to play live this project alone on stage. Often I have an idea about organizing only one concert with some session-musicians, some friends of mine, coming from the metal underground scene of my city, Verona, but I should consider all their daily commitments and there’s always less time for searching for musicians disposed to play with me on stage. For these and also for other reasons, I think that Silence Oath will remain a one-man-band project, in which I always can express myself and my darkest personality, without any external influence and without any kind of pressure. Simply, I am a musician moved by a lasting passion for all kind of metal music, for composition, guitar and singing. The music made by Silence Oath contains many ingredients that could be interesting for a metalhead looking for some new symphonic black metal bands. These are the only reasons to be interested in a one-man-band like Silence Oath; I sincerely hope that webzines will take care about this project, but I spread my music with honesty and humility and I know well how the way to emerge is very hard. In the closest future, I will wait for the official release of my album "Beneath A Bleeding Sky” under Invincible Records label. In the next months, probably I’ll start to organize the recording sessions for my next opus that I’ve written during the last two years. I can say that the next album will be more different than "Beneath A Bleeding Sky”; in fact "Beneath A Bleeding Sky” is oriented to the classical clichés that you can find in every sympho-black release, but for the next album I’ve composed more complex and longer songs, with many acoustic parts and progressive riffs, creating a base of symphonic black metal with many different influences. All these features will make Silence Oath’s music much more interesting for all who is looking for something new and something more experimental in metal music. I hope listeners will like it! Anyway, every detail about the next album will be revealed at the appropriate time. Nowadays, streaming and free downloading of "Beneath A Bleeding Sky” are no longer accessible, but the album will be available in January 2013, released by Invincible Records, in every good digital webstore as Amazon, Itunes, EMusic, Deezer, ecc…at the moment only in digital format, but for the future I hope also in CD version. I hope you all listen to my music and like it. Thank you very much for the interview and for your support! Bye!